Cloud With Me is a fully automated solution that simplifies and accelerates the setting up and maintenance of their AWS or Microsoft Azure cloud servers. This platform is designed to help users to upgrade their cloud infrastructure quickly and effortlessly, without any hassle or prior technical knowledge. Cloud With Me delivers fully managed cloud hosting services. At the same time, it guarantees uptime, security, and speed. Beefing up your infrastructure to AWS or Azure can be complicated and costly. Cloud With Me changes all that with an approach that is both user-friendly and budget-friendly altogether. Improving your infrastructure can be quite demanding in terms of time and money. The whole process also requires a high level of technical expertise and experience, which could mean poor performance of your business if you opt to delay the upgrade. Simply put, enhancing your infrastructure to either AWS or Microsoft Azure can be a daunting prospect. So daunting that it fully occupies your mind while costing you time and money. 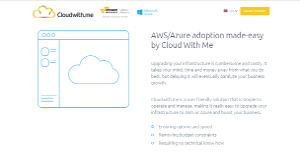 Cloud With Me takes all your worries out of the window by simplifying the whole process of upgrading your infrastructure to AWS or Microsoft Azure. With a simple and straightforward solution, you can easily operate and manage the upgrade to AWS or Azure and then sit back and watch your business growth spurred onward. Cloud With Me enables you to fully take your infrastructure to the next level even if you do not have the technical expertise or IT knowledge. And you don’t have to shell out a humongous amount of money to get the job done. Cloud With Me is created to help you enhance your cloud infrastructure without hurting your budget. And because you never have to be concerned with the technical side of improving your infrastructure, all you have to focus on is growing your core business. What Problems Will Cloud With Me Solve? There are a lot of issues that customers face when switching the hosting solutions. Cloud With Me allows you to adopt AWS in minutes with zero resources or tech knowledge. To get started, all customers have to do is introduce their domain name, select what region they want to run the server in, server plan they need (Basic, Startup, Developer, Business or Enterprise) and whether they want to install any additional software packages like WordPress, Drupal, and Magento, or an email, database or FTP server. Since each organization has particular business requirements, it is advisable for them to desist from looking for a one-size-fits-all perfect software application. Needless to say, it would be futile to try to find such a platform even among market-leading software solutions. The clever thing to do would be to catalog the various essential factors that need consideration such as required features, budget, skill levels of staff members, company size etc. Then, you should do your homework thoroughly. Read some Cloud With Me reviews and investigate each of the other systems in your shortlist in detail. Such exhaustive homework can make certain you reject ill-fitting platforms and select the app that provides all the elements you require for business success. How Much Does Cloud With Me Cost? We realize that when you make a decision to buy IT Management Software it’s important not only to see how experts evaluate it in their reviews, but also to find out if the real people and companies that buy it are actually satisfied with the product. That’s why we’ve created our behavior-based Customer Satisfaction Algorithm™ that gathers customer reviews, comments and Cloud With Me reviews across a wide range of social media sites. The data is then presented in an easy to digest form showing how many people had positive and negative experience with Cloud With Me. With that information at hand you should be equipped to make an informed buying decision that you won’t regret. What are Cloud With Me pricing details? What integrations are available for Cloud With Me?